At Jonkers Farm we host a limited number of rustic, boho-chic weddings per season. The farm is isolated, private and quiet. Jonkers Farm remains a real working farm after 100 years, so it is an ideal location to showcase New Zealand. With over twenty years of experience in location management, we utilise the very best of the outdoors and beautiful views with the best vendors in the industry to create a pop up wedding or event like no other, so every event is completely unique. The Woodland is a naturally occurring cathedral here at Jonkers Farm. It is the perfect place for your ceremony. The Woodland is furnished with woodland seating made from wood off Jonkers Farm. 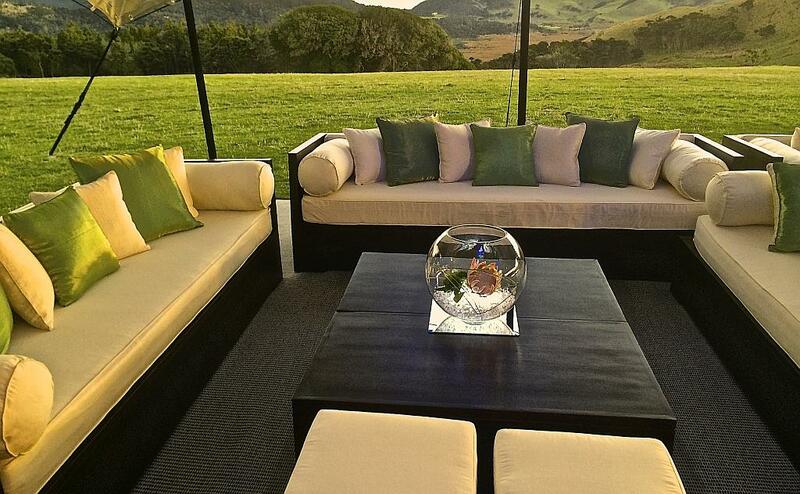 Pre dinner drinks and nibbles can be in The Woodland with beautiful live music or sprawling out into the paddock overlooking the beautiful vista of Bethells Beach and Muriwai. Ideal for lawn games, live bands, chic festival vibes. The photographic opportunities here at Jonkers Farm are endless and it is the perfect canvas to create a look that is unique to you. We have elevated, twin coast views of Muriwai and Bethells Beach, vintage farm buildings, rocky areas, woodland, vistas, long grass, a 1940’s woodshed, a vintage rustic handcrafted totara gate and film sets from Black Beauty and Mahana that make perfect photographic backdrops. 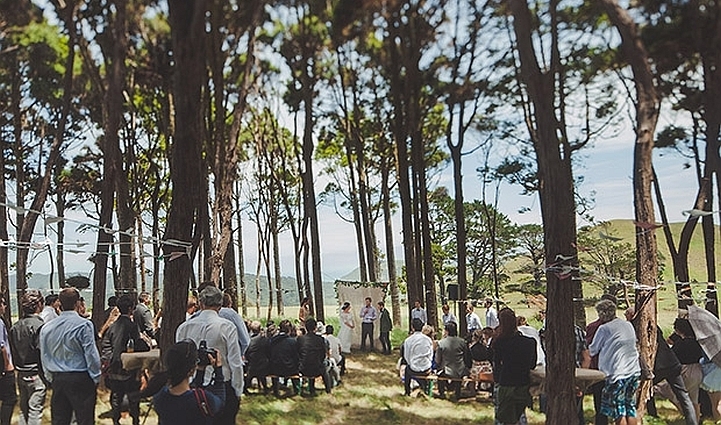 The wedding areas at Jonkers Farm are free from power poles and any modern day paraphernalia which is why we are one of New Zealand’s most popular rural film locations. After celebrations can be under a chic canopy, a rustic tipi, a clear marquee or in a “The Shed” which is our real working farm shed. All of these options make the very best of the land and create an event that is elegant yet laid back with just the right amount of WOW factor. What we Provide: The Woodland and Woodland seating for your ceremony, a beautiful location for your marquee and after celebrations, The Vintage Shuttle Truck is a designated vehicle for the Bridal Party to be taken to the ceremony and to have photographs at different locations around the farm, Sunset Photographs at the top of Puketotara in Kawasaki Mule, Three guest transfer vehicles with drivers for the duration of your event, Serviced Toilets during the event (includes paper, sanitary, hand towels) Rubbish bins and Rubbish disposal, Generator and a selection of leads and junction box for your electricity requirements, seasonal foliage for your flora, secure parking, inward goods the day before your wedding, a set up day for you to set up your wedding and a pack down morning, Two supplier site visits before the event. Blackboard directional signs. The cost for this is $7500 plus GST for up to 100 guests, $8500 for up to 160 guests and $9500 for up to 200 guests. We can accomodate larger weddings which can be quoted on a case by case basis. In addition, you will need to choose either a canopy set up $5500 plus GST, a clear marquee set up $6500 plus GST, a tipi set up $8500 plus GST or The Farm Shed set up $3000 plus GST. Please note, these prices are indicative only. You can bring your own certified caterer or choose from our list of amazing catering vendors. Food styles vary from A la Carte, Food Trucks, Outdoor Barbeque, Spit, Low and Slow Grill, Served Platters, Degustation. At Jonkers Farm you will not get left with a huge beverage bill at the conclusion of your event, this is because we allow you to BYO drinks for $12 plus GST per head. We are vintage. Because the Jonkers Family have been on the land for almost 100 years, we have a great selection of authentic, vintage props for hire, along with wine barrels, wood slabs and hay bales. We love every event we host and aim for perfection, therefore we only allow preferred suppliers for marquee installations. This ensures an event of a very high standard. Booking dates are limited and are secured with a 50% non refundable deposit on the location package. At Jonkers Farm our events are awesome. We have a fresh approach to creating an event with a difference. Whether it be a small, intimate gathering or a massive gig, we will blow your mind. We have a wealth of experience in production management and a passion for all events. At Jonkers Farm we can promise you complete isolated privacy, flexibility and excellent suppliers to make your event unforgettable. We have some very unique games/team building tasks that have been passed through the generations. Events are quoted on a case by case basis as we have such an extreme range of events here at the farm. Contact us for your individual event needs today. For ninety years, five generations of the Jonkers family have farmed the land at Puketotara (the original Maori name for the land on which Jonkers Farm now stands) and run it as a working farm. This spectacular 540 acre property is also a global destination for film and special events.